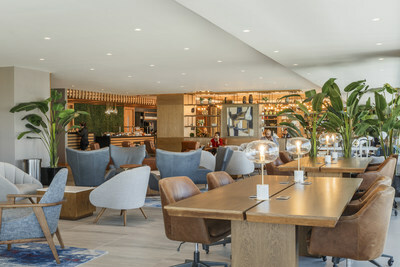 LONDON, March 26, 2019 /PRNewswire/ -- The original and market-leading airport experiences program, Priority Pass™, has revealed the winners of its Global Airport Lounge of the Year Awards. Whisky walls, private double-bed suites, spa treatments, and celebrity chef-endorsed menus are just some of the innovative offerings featured in the top-rated lounges, located in countries including Ecuador, United Arab Emirates, Latvia, Thailand and Mexico. Now in its 14th year, the awards are based on the ratings of 52,000 Priority Pass Members and recognize airport lounges offering the best service, experience, refreshments and business facilities. Priority Pass' lounge portfolio has grown by 10% in the last year and now incorporates over 1,200 lounges in more than 500 cities globally, across 143 countries. This year's global winner is the Sala VIP Internacional, operated by Corporación Quiport, at Quito International Airport in Ecuador, the main gateway into the country and the only greenfield airport in South America. Sala VIP Internacional put the customer experience at the heart of their recent lounge expansion and pride themselves on offering services that will cater to everyone's needs. One of the main highlights of this lounge is the outdoor terrace with panoramic views of the city, providing a space that captures the light and color of Ecuador's vibrant capital. The lounge is fitted out with ample and distinguished locally sourced furnishings providing a luxurious and cultural feel. The lounge menu, designed by renowned local chef Andrés Miño, includes international and Ecuadorian cuisine, and guests can enjoy a variety of wines from the lounge's private cellar, while watching Quito's beautiful sunsets. This modern and elegant lounge is open around the clock and features private working spaces, dedicated sleeping areas, a massage room, and showers for guests to refresh themselves before a long flight or during a layover. The Global Airport Lounge of the Year Awards analyses the results of votes across several categories including business facilities, comfort, service from lounge staff and food and drink. This year, Quito's Sala VIP Internacional took the top spot in all of these categories. Andrew O'Brian, President and CEO at Quiport, operator of Sala VIP Internacional said: "It's an honor to be named as the global winner of this year's Global Airport Lounge of the Year Awards. We're proud to offer a universal space where passengers can relax and unwind whilst still capturing the special Quito spirit – warmth, colour and great food! "Taking in our famous sunsets while surrounded by the jacaranda and jasmine that adorn our terrace is the perfect way to relax before a flight and we're thrilled that this unique experience, coupled with our excellent customer service, has left a lasting impression on our guests." Amongst stiff competition, the Primeclass Riga Business Lounge at Riga International Airport in Latvia has been crowned the top lounge in Europe. Located in the largest airport in the Baltic states, this spacious lounge has large glass windows that provide great views of the runway. To keep with Latvian traditions and culture, the lounge offers signature Latvian dishes and drinks including Balsam, and has recently collaborated with local artists, such as Arvils Linde, to exhibit different artworks throughout. The lounge was most recommended by Members and is equipped with other stand-out features, including a conference room, a children's play area and showers. The Northern Lights Executive Lounge in Aberdeen International Airport in Scotland was announced as the runner-up in the region, taking home the 'Highly Commended' award. This lounge is known for its excellent locally-inspired food and drinks offering, endorsed by Craig Wilson, Aberdeenshire's "Kilted Chef", which includes Aberdeen Angus beef burgers and a dedicated whisky wall. This year's winning lounges are also investing in improved business facilities, making sure visitors can catch up on work without distractions. Sala VIP Internacional in Quito has equipped nearly all seats with power outlets, including dining tables, so customers can stay connected. More widely, conferencing facilities are available in many Priority Pass lounges, with TV screens and video systems available for interactive presentations. Highly-ranked lounges such as SATS Premier Lounge at Terminal 3, Changi International Airport, are also equipped with dedicated, private business workstations. Andy Besant, Director of Travel Experiences at Collinson, operator of Priority Pass, said: "Some less explored destinations have performed particularly well in this year's rankings. As intrepid travel continues to rise, we're noticing increased traffic in lounges at airports that are off the traditional tourist trail and veer from expected flight paths, highlighting the outstanding experiences that are offered in lounges the world over. "Priority Pass is committed to offering its Members access to the best airport lounges across the world, and our global network of lounge partners ensures travelers can relax before their flight, improving their journey before it's even started." Priority Pass received over 52,000 ratings from its Members in this year's awards via the lounge rating function on the Priority Pass website and app. Members provide ratings on a wide range of criteria covering overall lounge quality, refreshments, staff, business facilities and ambience. Priority Pass is the original and market-leading airport experiences program. It provides discerning frequent travelers access to over 1,200 lounges and airport experiences in more than 500 cities across 143 countries, including a growing number of airport dining and spa offerings worldwide that can be accessed in the same way as lounges. Using the Priority Pass app for iOS and Android, Members can quickly and easily discover locations welcoming Priority Pass, instantly check their visit entitlement and use their Digital Membership Card to access airport lounges and experiences. Priority Pass is operated by Collinson, a global leader in customer benefits and loyalty. Collinson delivers exceptional travel, insurance and assistance products that differentiate value propositions, and loyalty solutions that win deeper, more valuable customer relationships. For over 30 years, we've been chosen by the world's leading payment networks, 600+ banks, 90+ airlines and 20+ hotel groups to craft customer experiences that win competitive edge. This enables them to acquire, engage and retain the most profitable, but most demanding customers.